Recommend Toytech lift which is better than OME because you can adjust the front coils to get rid of the FJ lean. I'm running Icon but have had some issues. Full Bud-built skids. Knock a hole in your driveline and it will cost you way more than the skids. Sliders are a must and the OEM ones are fine despite all the contrary noise you might hear. Often for sale cheap when guys replace them with "better sliders". I've worn out many sets of BFG A/Ts and liked them but new favorite tire is Goodyear Duratrac. Don't listen to all the naysayers about poor handling with a lift and taller tires. If you want it to handle like a sports car then buy one. I'm running 3" lift and 35" tires on my daily driver and it suits me just fine. I will say that the big tires are rougher on front end components. I can live with that knowing my FJ can go anywhere I dare point it. The first mod I made to my FJ was a BajaRack. It has since proven to be the most "worth it" mod I have made. It gets the stuff that was otherwise stuffed in the back of the truck out and on the roof (jerry cans, shovel, Hi-lift). I went with the Ironman constant load suspension, and i love it. I have had two bumpers, a custom one and now a metaltech. My advice would echo what the others have said above. drive it for a while and you will figure out what you need. The best things I have on board are my GPS, a good recovery kit, and a well thought out and packed emergency bag (go bag, bail out bag, whatever you want to call it). If 99% of the people on message boards are honest, they will admit that most of their mods are for the cool factor, or aesthetics. I bought stock steel wheels, because they look cool. The alloys were fine, but I wanted to go for the "black out" effect. I also got all the trail teams trim parts (about $600.00) because they look cool and I could afford it. I would agree with most everything said. I can say that stock suspension and steel skids WILL lose some clearance. Those things are heavy! 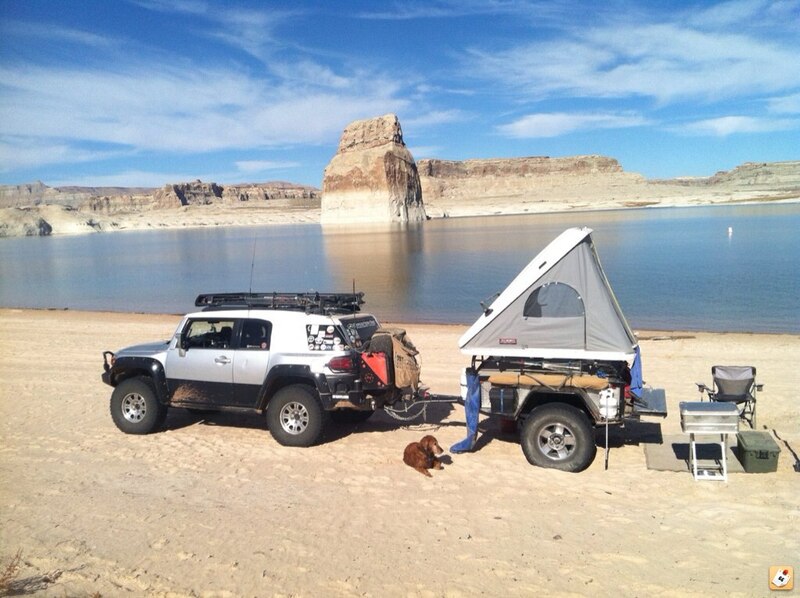 I have a Baja rack and it was great when I used my RTT on Fj but otherwise the wind noise was to irritating so I took it off. I ran a spacer lift for about a year now...does its job but it did make my truck a bit more bumpy and wander the road. So I am now installing an Icon lift with camburg UCAs. Modifying can be a slippery slope. I got skids because I scraped my front factory plate but then the extra weight made me BANG my new skids 10 times as much on the same trail! Added spacers but don't like the ride. Now doing icon but it's expensive! And don't let me say anything about lost power due to weight and bigger tires. So I'd say, enjoy your FJ in stock form for as long as possible! I should have been as specific as other members and noted that I was refering to the STOCK suspension coils. They are soft, I dare say, sometimes even for the street. It almost goes without saying that a suspension lift will help counteract the extra weight from accessories and protection gear though extra spring height and increased spring stiffness. As said above a spacer lift won't do anything for your ride and handling of loads because you'll still be on stock springs under those spacers. I came to my FJC after 13yrs in a GTI and had not owned a 4x4 since the early 90s, so at first I figured the amount of body roll and nose dive under braking was just a 'necessary' compromise made for offroad flexibilty. Since then I have learned a lot of lessons from the experiences of the more 'veteran' FJC owners on various forums and from my continued use of my truck. Sure, any vehicle is compromised straight from the factory to suit the needs of many buyers. It's down to the individual owner to minimize those compromises that most affect how they use their particular vehicle in their primary environment. if you are thinking you might want bigger tires sooner than later then i might be cheaper to spend the money on a lift now and get the tire size you want. The Ironman constant load (~2") kit rides really well and it is very affordable. There is no worse feeling than spending $1k on tires and then wanting to replace them 6 months down the road as you decided you wanted a lift due to adding weight to the truck. Been there done that. I have gone the route of driving ours a bit before deciding what we need. My two biggest issues have been stock spring rate/load capacity and the stock rack. Stock with good tires, it is rather shocking what an FJC can do..... Coming from a diehard Land Cruiser guy. Click the link in my sig and you can see a few trips I have done with ours, being stick other than the bumpers and winch.